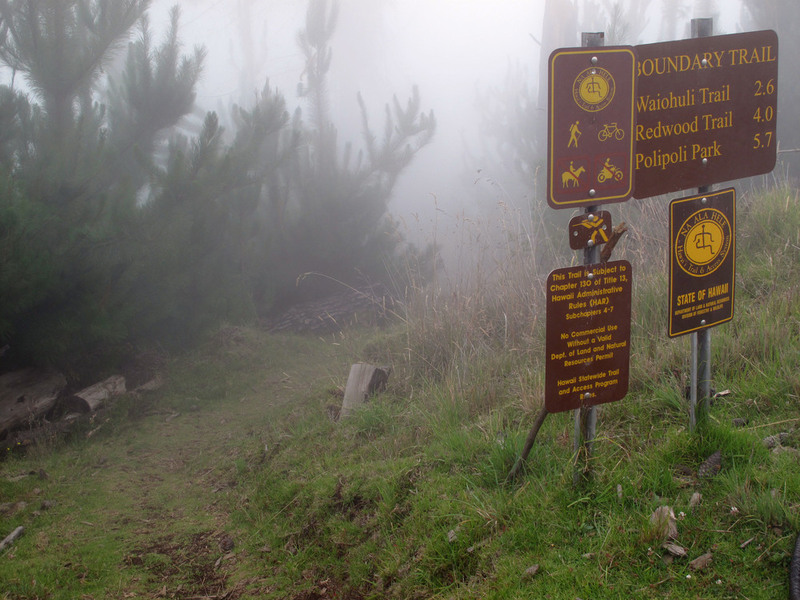 Mamane is an all-mountain downhill trail that is among the crown jewels of mountain biking on Maui. Mamane, named after the Mamane tree, it can be accessed by bicycle from the summit of Haleakala via skyline road. ( Sorry, we do not allow our rental mountain bikes on this section, they are cross country style bikes and not suited for this section). With our bikes the only access for Poli Poli is via Waipoli Road. Mamane descends more than 800’ over 1.8 miles from the trailhead on skyline to its conclusion on Waipoli Road. The start of the trail is above treeline and rolls smooth and fast. As the trail progresses it quickly descends into low brush and tree cover and becomes increasingly technical. Rocky and rooty sections abound. The trail becomes the most technical at the bottom. When it is dry the soil is the consistency of fine silt. Riding in dry conditions may compromise traction and can create clouds of dust. Many people prefer to ride Mamane when the ground is moist and tacky. Redwood trail is a 1.5-mile trail with an elevation gain/loss of 750’. The trailhead for Redwood is located at Poli Poli Spring state recreation area. Proceed beyond the gate leading to the cabin and look to your right. Redwood trail is a fun descent and challenging climb that switchbacks through a redwood forest. Sections of native ferns create a bright contrast against the fallen, brown pine needles and dark barks of the Redwood trees. If time is not an issue; pause to appreciate the quiet and serenity of your surroundings. Redwood is an extremely technical trail dominated by exposed roots. If these roots are wet (even a little) they can be very slippery. The trail is the safest to ride when conditions are dry. Use caution when climbing and descending. Riders should be aware that this trail culminates at the parks lowest elevation. There are two options to climb back out and both are extremely challenging. The first option is to “turn & burn”. The second option is to take boundary trail. This trail should only ridden by experienced riders who are confident about their fitness. Boundary is cross-country trail that skirts the western boundary of the park at its lowest elevation. The trail descends 1100’ over 3.5 miles. The trailhead intersects with Waipoli road after the road transitions from asphalt to gravel. The trailhead can be found to the right after the cattle guard. Boundary is a versatile trail with definitive sections of pine, eucalyptus and redwoods. The trail is interspersed with beautiful volcanic gulches and breathtaking panoramic views of upcountry, central and West Maui Mountains. The trail begins with a .7 mile decent that switch backs through sections of grass, shrubs and trees. The trail then begins to wind toward the southwest as it passes through stands of pine, eucalyptus and redwoods. While the trail continues to descend there are plenty of short, punchy climbs and challenging technical sections as the trail weaves in and out of volcanic gulches. Riders should be aware that this trail culminates at the parks lowest elevation. There are two options to climb back out and both are extremely challenging. The first option is to “turn & burn”. The second option is to take redwood trail. This trail should only ridden by experienced riders who are confident about their fitness. Waikoa trail is a self-contained loop trail that is located on the northern side of the park. Waikoa trail is a technical cross country trail. The loop is 2.5 miles long and its accessed by a .75 mile fire road. Typically the trail is ridden counter clockwise, but can be approached in reverse. From the hunter check-in station, access the fire road through the gate. The road will descend briefly before turning right into an immediate steep climb. At the summit of this short punchy climb the road traverses for another half mile before culminating at a gate. Please be sure to close this gate before proceeding on the loop trail. Past the gate the trail immediately turns into single track. After the first few turns the trail forks, stay to the right if you want to ride the loop counter clockwise. The trail traverses .75 through stands of eucalyptus as it winds in and out of technical gulches of volcanic rock. The trail then descends 450 feet over .75 miles of switch backs. The descent passes through fields of grass and stands of pine and eucalyptus. At the bottom of the descent the trail traverses a wide path for .4 miles before it starts to climb back up a switch backs for another .6 miles.